Complete Pre-Configured Panels & Racks W/ Bins | Morrison Industrial Equipment Co. Measures 36" L x 8" W x 19" H and 27" L x 8" W x 21" H. Both bench racks are available in 3 preconfigured choices. Bench racks can be joined together to form continuous systems. 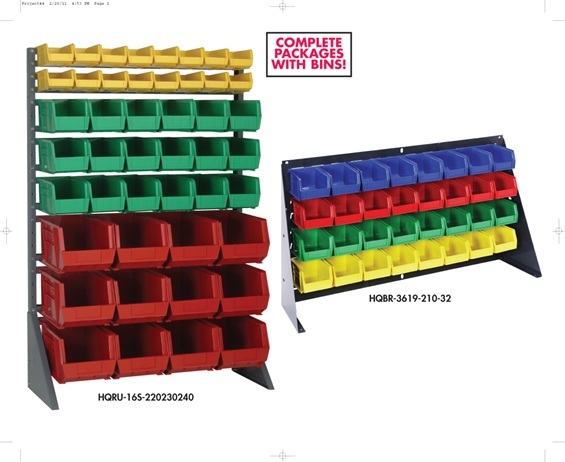 Bins available in Blue, Yellow, Red, Green, Ivory, or Black. One bin color per unit. Measures 36" L x 19" H and 18" L x 19" H. Each available in 3 configurations. Bins available in Blue, Yellow, Red, Green, Ivory, or Black. One bin color per unit. Measures 36" L x 15" W x 53" H, 250 lb. cap. Available in 3 different configurations. Bins are available in Blue, Yellow, Red, Green, Ivory and Black. One bin color per unit. Measures 36" L x 25" W x 53" H, 500 lb. cap. Available in 3 different configurations. 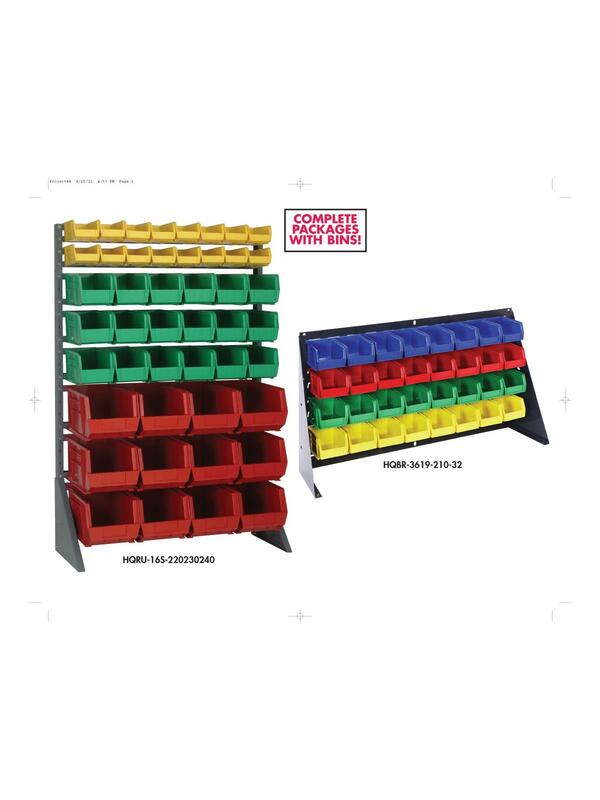 Mobilize double sided unit with the addition of HQRU-MOB. Bins are available in Blue, Yellow, Red, Green, Ivory and Black. One bin color per unit. See Related Items tab for Mobile Unit. 5-3/8 x 4-1/8 x 3"5-3/8 4-1/8 3"